Final day in India. I thought things were going relatively well for days until yesterday. As usual, we were at my in-laws’ house. We brought our laundry along. Since my MIL is usually afraid of anything electrical, my FIL is usually the one who operates the washing machine. I vaguely remember that he did Bob’s laundry on our last trip. It was a lot cooler last time so I didn’t need to wash my clothes. This time I sweat a lot more so I also had laundry to do. I was doing my own thing and didn’t pay much attention to what was going on. All of a sudden I heard that my MIL was raising her voice at Bob in Tamil. Bob came to her and muttered something. She yelled at him and he started yelling back. I had no clue what was going on. My instinct was to tell him not to yell at his mom, so I did. He then stormed to the balcony where his dad was. His mom was immediately upset and started tearing up. A minute later, his dad came into the house and started yelling at Bob’s mom. I was very confused and went to the balcony to see Bob. He was holding a bunch of wet clothes looking very annoyed. After talking to him, this is what I gathered. His dad was not pleased that Bob handed him my clothes to wash. Bob wouldn’t have minded handling my clothes, meaning hanging them dry. But he didn’t know that his dad was already in the balcony trying to hang Bob’s clothes only. By the time his mom raised her voice to tell Bob, Bob had gotten up to go to the washing machine which is in another room from the balcony. His mom didn’t realize that he had gotten up to go help. When he was walking to the balcony to help, she yelled at him for treating his dad like a lowly laundromat worker. His dad also yelled at him and said that he should’ve known better to not hand his dad my clothes. This is all out of pride and lack of communication. And it is definitely not just about laundry. According to Bob, things have been brewing ever since we arrived in India. I didn’t know because he had been shielding me from it all. But basically, his parents are still treating him like a little boy, thinking that he should’ve done a lot of things that they told him to do. These include staying at the big corporation job, marrying someone that they choose, so that they can come to the States freely being taken care of by their chosen Indian Hindu Brahmin daughter-in-law. None of this has happened. He switched over from a big corporation to a start-up company and ended up losing his job. He married somebody older and non-Indian that wasn’t chosen by them. They have no desires to come visit us because of me. They don’t see that these things happened for a reason. There is really not much we can do to change their thought process. Poor Bob. Instead of getting yelled at by his mom every week on Sky.pe, he gets yelled at in person every single day. This is what I don’t get. We have been married for almost three years. They have known this for five years now. They don’t get to see Bob all that much. They get to spend 9 to 10 days together every two years. Why not use this chance to be nice to one another and just enjoy the time together? Why spend the energy on fighting each other? I really don’t get it. Bob was so angry at his parents that he wanted to leave right away. He also said that he didn’t want to come today, the last day of our stay. I didn’t say much but I told him that after he’s done being mad, he’d change his mind. He patched things up with his dad quickly, but his mom refused to talk to him for the rest of the day. She was actually talking to him through me. She said that she was too sick to cook so she would take me to a restaurant for dinner. She complained to me about Bob. I was determined to stay out of it and not to take sides. The funny thing was, during those hours that they had this fight, there were these unannounced visitors. His mom was in the middle of crying and the doorbell rang. She opened the door and the visitors came in and chatted. Then everyone appeared like nothing had happened. The cold shoulder continued when the visitors left. Then some other unexpected visitor would come, and this whole thing would start all over again. I am not worried about them. They are a family so they will sort things out. Today his mom still appears to be a bit mad. But they have patched things up for the most part. I just wish that there is a way for them to improve their relationship by accepting the way Bob is. On some level, they may have felt betrayed by a son that did not fulfill the dreams that they have for him. They are taking an extremely long time to get over it. We have been praying for them to get to that place in the future. This visit shows me that there is still a long way to go. One thing I am very sure of is that we will NOT stay with my in-laws the next time we come. We need that personal space away from them daily to recharge and to rest. I can’t imagine how good Bob’s psyche would be if he had to endure this kind of interaction 24×7 for more than a week. I don’t think I can stand not having a place to just be myself. Nine more hours. I can smell freedom. 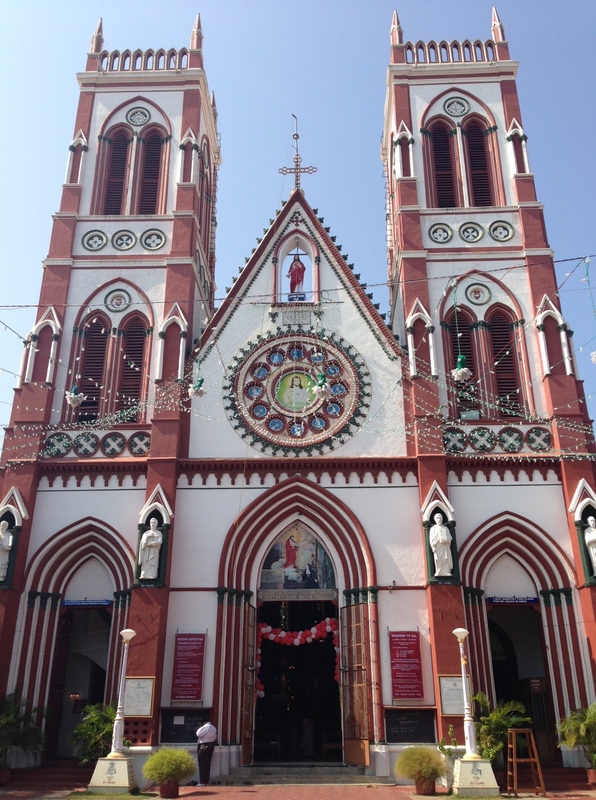 Day six in India. Things are going relatively well. I’m surviving having a period during this time. I’m also surviving hanging out with my in-laws daily. By hanging out, I mean I bring my laptop, iPhone, magazines, and books, and sit in my in-laws’ living room throughout the day. Bob and his parents would chat and do whatever they do and speak in Tamil. I will try my best to go online and chat with whomever is still online on Facebook. I am kind of hooked on 2048. I rarely play any games on the phone. Before I left for the trip, I searched for the game that had the highest rating and found 2048. I can understand why now. Anyhow, I did it because I knew that I would be doing what I am doing everyday, sitting at my in-laws. My in-laws are “interesting” people. At least, their lifestyle and Bob’s upbringing are very different from what I am used to. My MIL doesn’t believe in eating out. She cooks every single meal daily. In fact, when they came to visit Bob five years ago in the States for almost two months, she cooked every single meal except for eating out once. 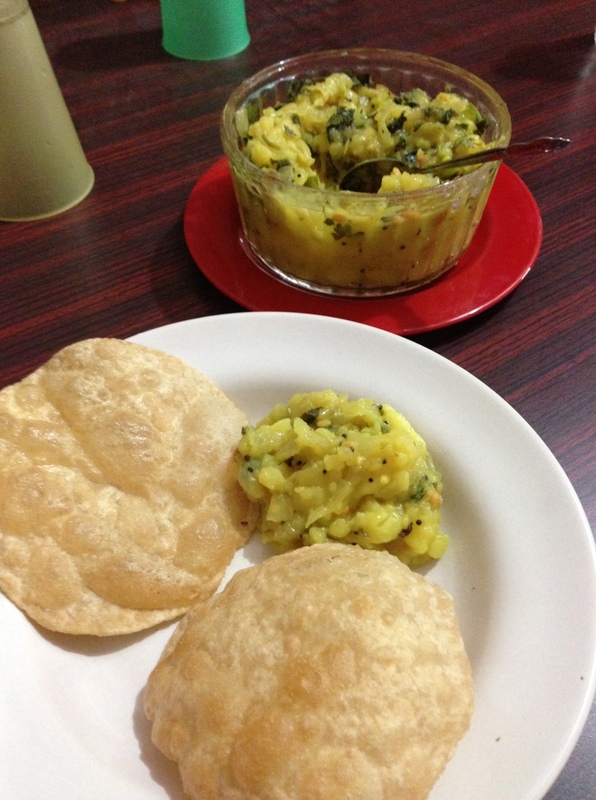 I can understand my husband’s preference of eating at home and why he had a very difficult time with the concept of going to a restaurant when we first started dating. 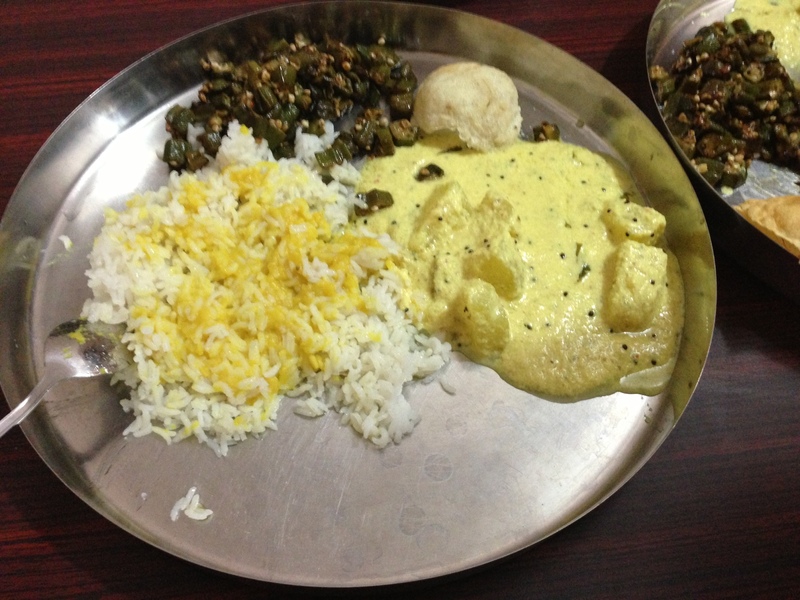 So my MIL’s idea of our time in India is for us to go to their house daily for both lunch and dinner. She also wants to see her son most of the day since it had been two plus years since they all got together. That I get. But, imagine me flying all the way to India sitting in my in-laws’ living room daily. You may say that we can arrange for my in-laws to go sightseeing or shopping or hanging out with us so that we can all have fun together? Then there is my FIL who does not like to go out. He’s a homebody and doesn’t change that for anyone, even his son. The only time that he would go out is to go with Bob to see Bob’s grandma, who lives about 10 minutes walking distance away. Otherwise, Bob’s dad stays home. In order to hang out with his dad, Bob stays home too. And Bob’s wife? She stays wherever her husband is. Hence, iPhone, laptop, magazines, books, and games. This is how my MIL’s ideal day will go: We arrive at their house in the morning, have lunch there, hang out in the afternoon, have dinner, and go back to the hotel. This is how my ideal day will go: We have breakfast, chill, workout, or do whatever we want to in the hotel, head to a sightseeing place/mall/whatever, have lunch, head to his parents’ place for dinner, and head back to the hotel. You see the difference? I think my way is better because you keep a non-Indian wife sane while allowing my MIL to have her time with her only child. But I don’t get my way all the time. So we headed over to my in-laws’ for two days. With the spotty internet, it’s sometimes difficult to maintain my sanity. My MIL doesn’t want to go out in the afternoon because of the heat but she often wants to take us out instead of letting us venture on our own. Yesterday, we didn’t head out until 5 something. We first went to my MIL’s uncle and aunt’s house for a visit. 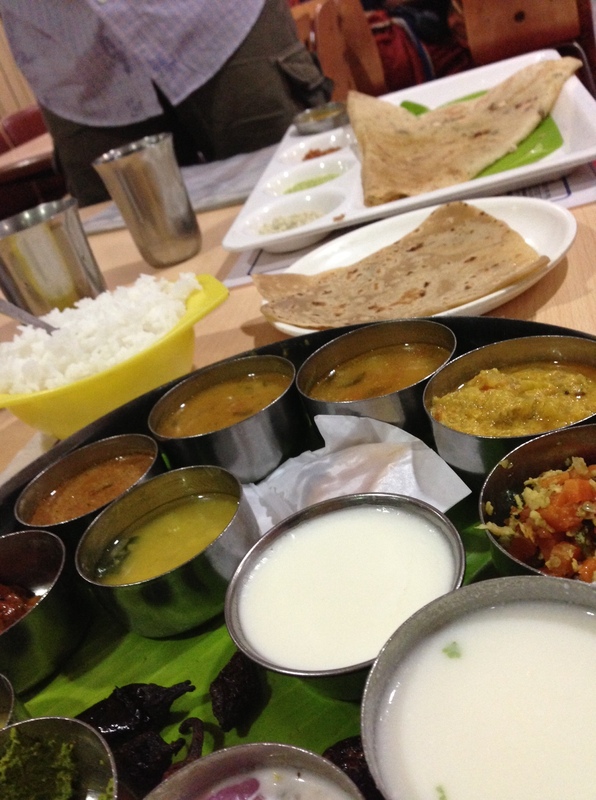 Again, I sat there, smiled, and did not understand a word of Tamil there. When we were leaving, I was given a parting gift with a piece of cloth called blouse bits, fruits, and a string of jasmine. 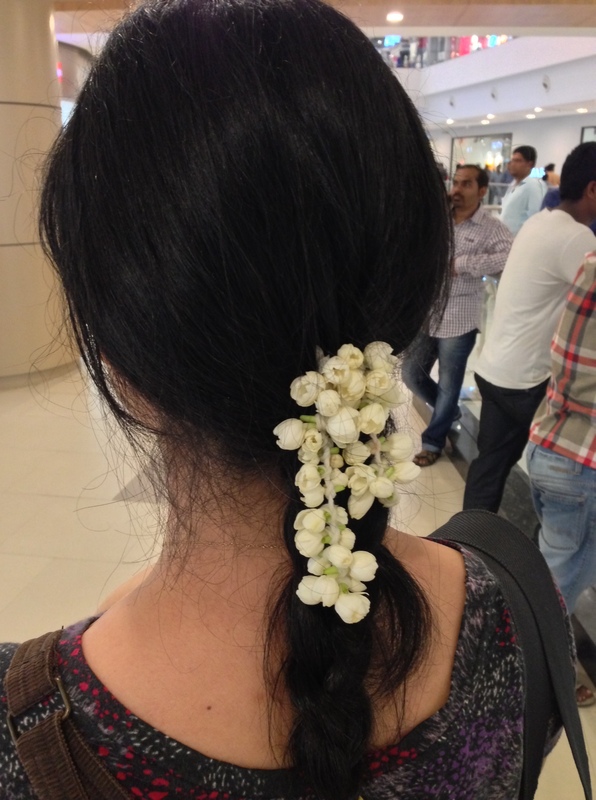 As a married woman, I am to tie that string of jasmine on my hair. So I did. There is a nice fragrance of jasmine lingering around me all night long. It was a total stranger. He didn’t ask us if it was okay for him to take an additional fare. He dropped us off early and claimed that it was our destination: the alley way that we needed to get to. Of course it wasn’t. So we had to walk quite a few blocks and asked for directions for a few times before we got to our first destination. After we left the relatives’ house, we were heading to a mall that was supposed to be only two miles away. We stood by the roadside and were quoted by many auto rickshaw drivers two times of what we were supposed to pay. My MIL finally settled on one guy who had absolutely no idea where he was going. Well, my MIL wasn’t any better than he was because she also had no clue what the mall was supposed to be called. The mall was called Phoenix Marketcity and she asked to go to “supermarket”. It’s beyond me how they communicated with each other and how we eventually got there. The guy stopped to get gas, raced his rickshaw down the roads in a general direction, and eventually stopped two more times to ask for directions from two auto rickshaw drivers. After an adventure of about 20 to 25 minutes, we got to this very modern looking mall. 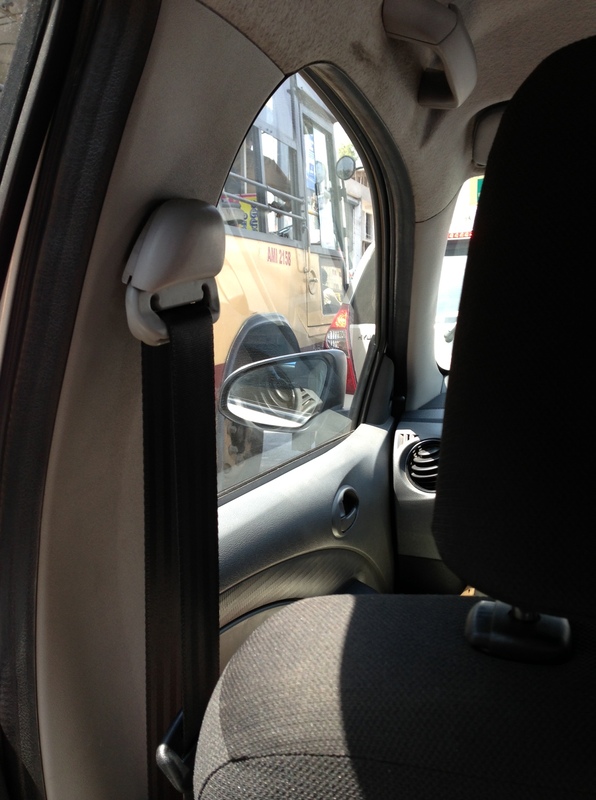 I was appalled that the auto driver had the guts to ask for 25% more of the fare because he drove longer. I was even more appalled that my MIL paid him. Didn’t we agree on one fare? The mall has many brands that are available in the US. I wasn’t interested in any of them. 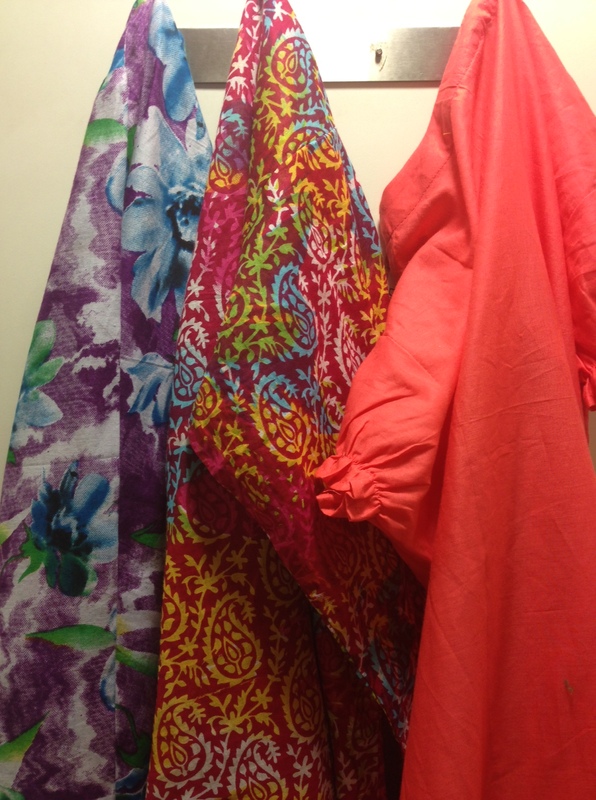 I knew that there are some Indian department stores that sell traditional Indian shirts. I bought a bunch of them at another mall last time. So we bypassed all the modern stores and went straight to an Indian department store. 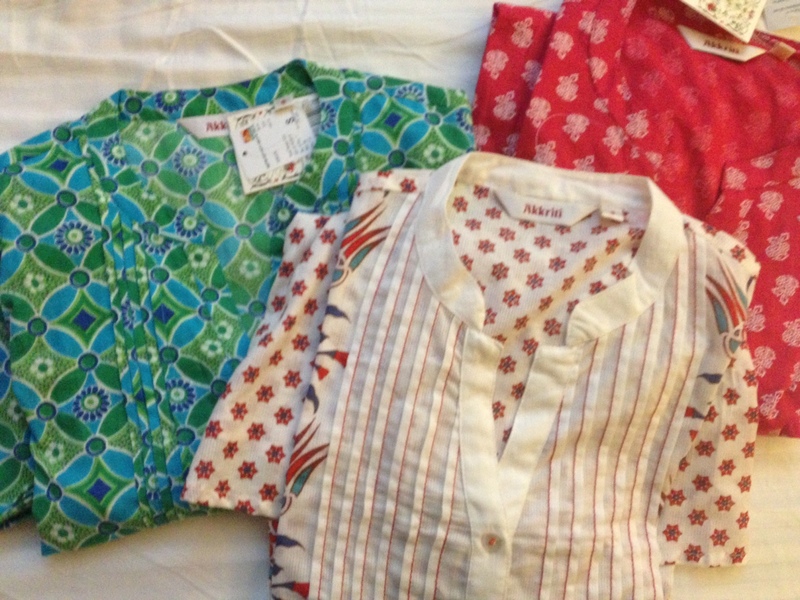 Happy to report that I got some very nice shirts. I was dead tired though. We didn’t eat until 9:30. Bob and I went to a food court. I ordered this meal with mutton… and 20 minutes later (don’t ask me why it took so long), we were given this tray with three pieces of mutton swimming in curry sauce. We were totally cheated by this place. Bob refused to wait in line any longer. We went to another place… and didn’t get back to the hotel until almost 11pm. i protested today. I don’t want to go sit at my MIL’s for the whole day and head out again late in the evening. So this morning, after Bob’s done with his job search stuff, we’ll head to the mall ourselves before we head to my in-laws’. This is my last chance to do some shopping before Bob spends quality time with his parents for the next three days. Hopefully the internet will be reliable at my FIL’s until we leave for Hong Kong. Not pleased that AF showed up today. Pleased that she didn’t come yesterday when we were traveling in a car for 2.5 hours and having a difficult time finding a decent restroom to relieve ourselves. I still got a few bug bites though. It’s inevitable. 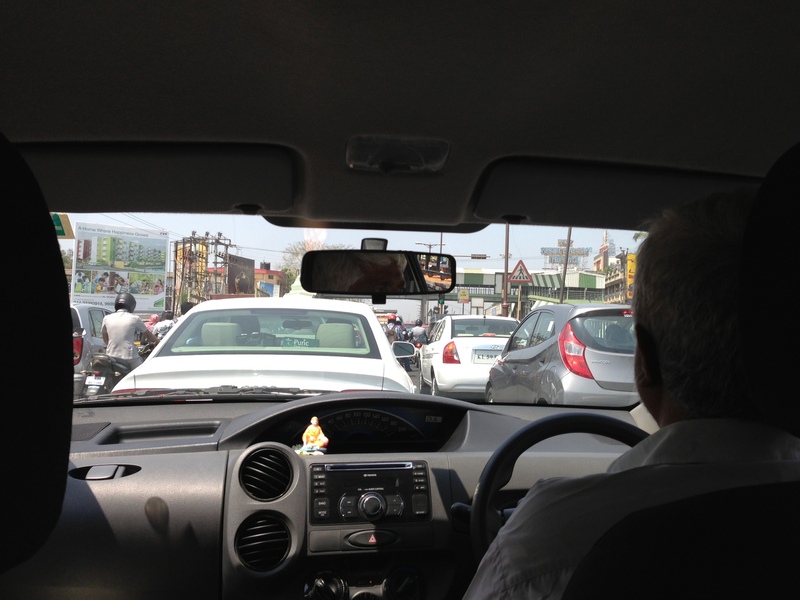 Indian drivers and traffic are a bit crazy. There are lanes but nobody observes them. The last time I was here, I had a heart attack every 12 seconds seeing how close all the cars, trucks, motorcycles, and auto rickshaws were to us. This time, I am totally unfazed by it all. I am sure accidents happen quite a lot. But I am not as easily startled as last time. You hear horns honking every three seconds. That’s just drivers’ ways of saying hi and telling the other drivers that they are passing them on the left, on the right, or whichever direction they choose to come from. See how close the cars were to one another? The streets in Pondicherry were filled with colonial buildings that were markedly different from other streets I have walked in South India. It was about 1pm when we arrived. The streets were dead as if everybody was taking a siesta. This place is known for its ashram, which didn’t open until 2pm. 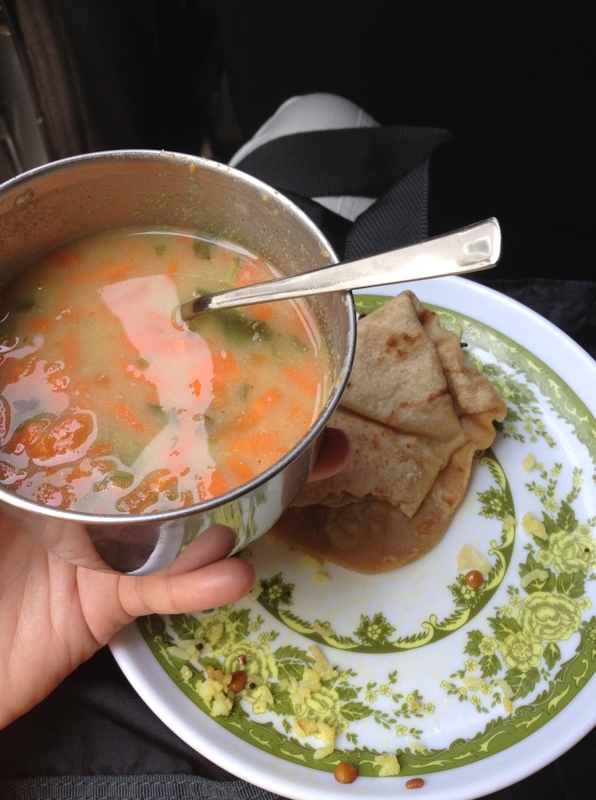 We walked around a little and ate the lunch that my mother-in-law prepared and packed for us in the car. I didn’t have any internet access so I had no clue what the actual temperature was. 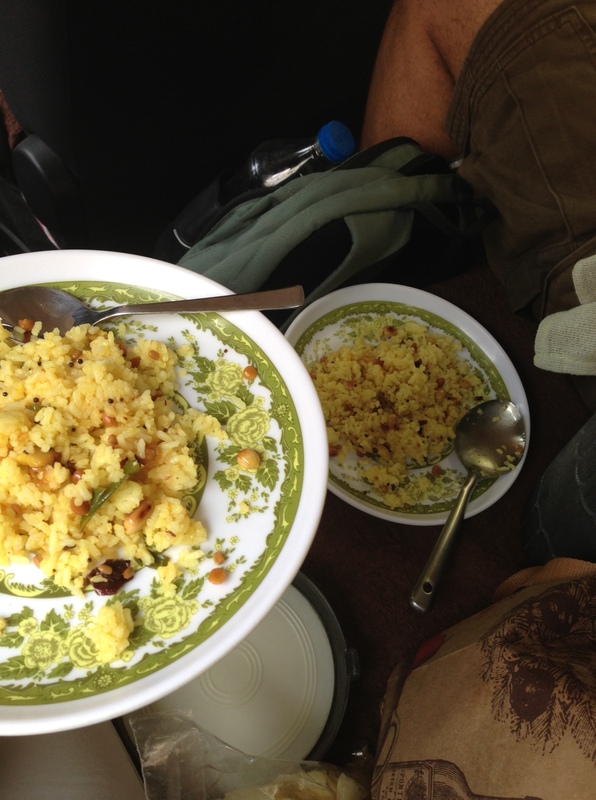 We parked in the shades but eating in the car without any breeze or moving air… it felt like over 100 degrees inside. My whole being was drenched in sweat. Still grateful for homemade lunch though. While waiting for the ashram to open, we were desperately in need of a bathroom. We couldn’t go explore because the driver left us with the car while he went to get lunch. I got sent by Bob to the post office to ask about a bathroom. The lady inside pointed me to a direction and said, walk two minutes then you’ll see pay toilets. I thanked her, looked out in the crazy hot sun, and thought, no thank you. A Caucasian lady walked by. We asked her about a bathroom. She said she was sure that one would be available at the ashram. Good thing the driver came back. Bob and I braved ourselves in the heat for a quest to locate a usable bathroom. We found an A/C restaurant and were told that the toilet was out of the restaurant around the corner. I went and it was again one of those squatty potty that smelled extra bad and was totally wet. Of course there was no flush and no toilet paper. I was prepared with a roll of toilet paper and I am very good at holding my breath. Being Chinese, I am also very good at squatting. I am just thankful that my period hadn’t come yesterday so I only had to take care of one thing. I don’t know if you realize but in India, people clean themselves with water only. Even at my in-laws, we bring our own toilet paper. It boggles my mind but it’s been their way of living for years and years and years. I’m in no position to judge but I am very thankful for toilet paper. I learned that an ashram is a monastery type place. People go there for meditation. 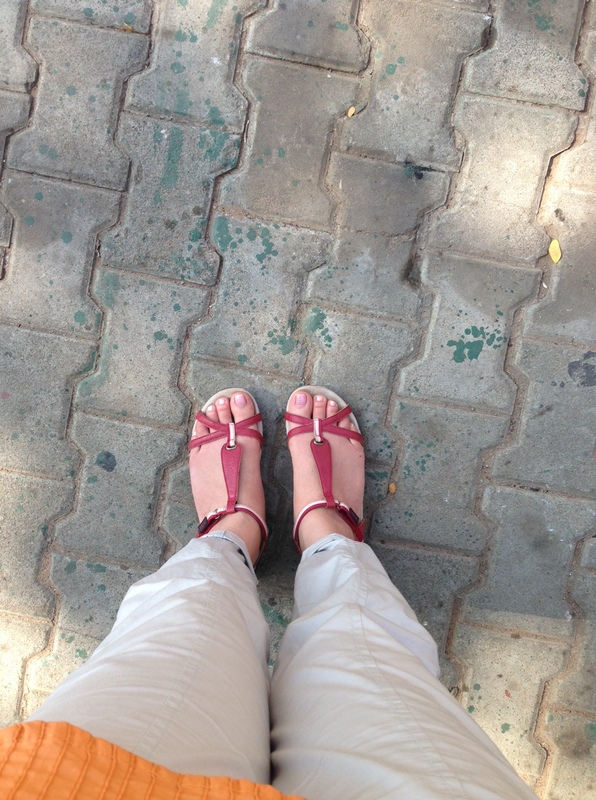 We were told to take off our shoes across the street from the ashram. We then had to walk barefoot across the street. The soles of my feet were burning like crazy. When we went inside, we walked around this courtyard and people were sitting on the ground with their eyes closed and meditating. We came back out after walking around a bit. My feet were black and dirty. You can call it an experience but I really hate to get my feet dirty. 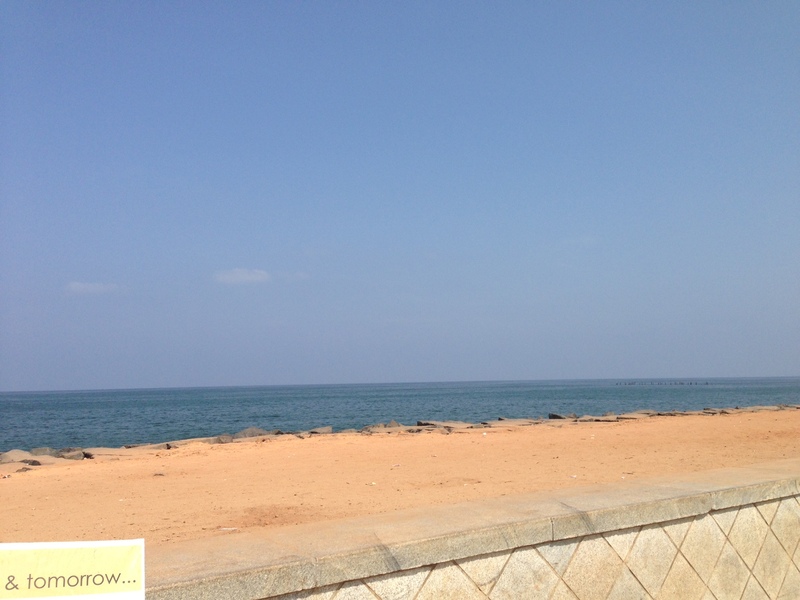 After that, we went to see the ocean. It was really hard to enjoy ourselves there as the heat was really getting to us. It was beautiful but it was about time to get back into the car. 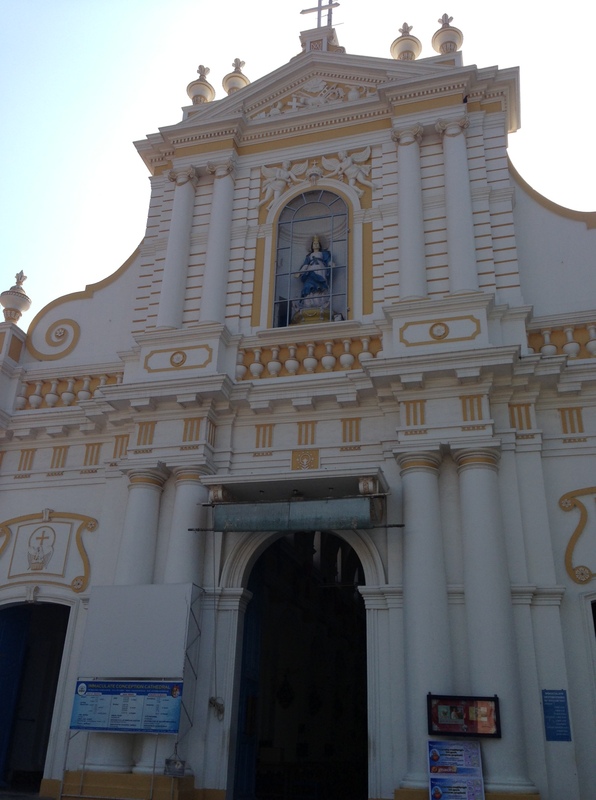 The driver took us to two churches. My whole person is so swollen that my feet are getting wider and harder to fit into my sandals. You can say that we didn’t do our research before we came here. 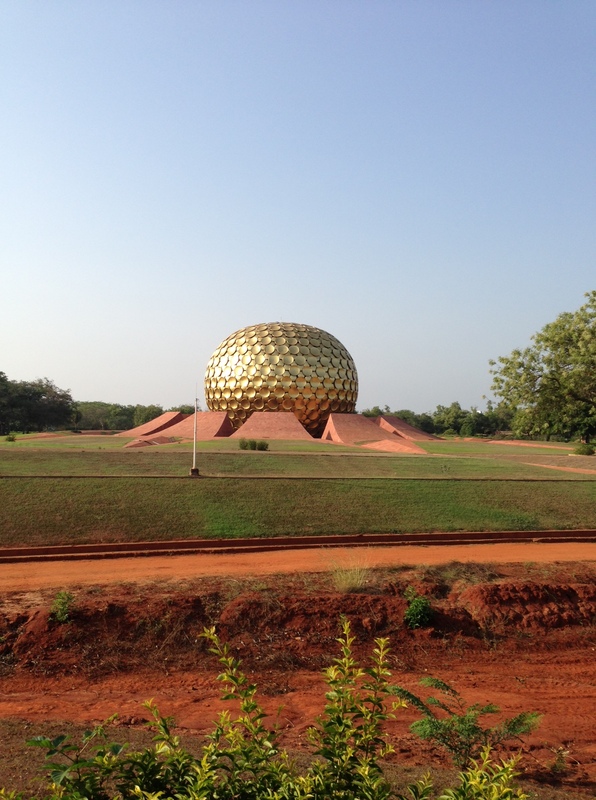 The driver drove us a little bit farther away to a place called Auroville. Before this trip, I had never heard of this place. I looked it up and it says, “Auroville is an experimental township in Viluppuram district in the state of Tamil Nadu, India, near Puducherry in South India.” I didn’t expect to have to go get a pass, walk about 1km to get to this golden metallic sphere which was the center of the town, called the Matrimandir. That walk really killed me. I was tired.. and hot… and we didn’t know how long it’d take to walk there. Dirt and sand kept getting into my sandals. Getting to that sphere thing wasn’t what I wanted to do at the moment. We did it anyways. I wasn’t touched by it… didn’t feel its power, tranquility, peace, or other words that were associated with it. I just wanted to leave. Luckily there was a shuttle that brought us back to the visitor’s center. It was then 5:20pm. I was happy to be traveling back to my in-laws. I slept all the way through the car ride, leaving Bob to be the only one experiencing the exciting Formula One race firsthand on the road. It was a heck of a long day. But I am glad we went. 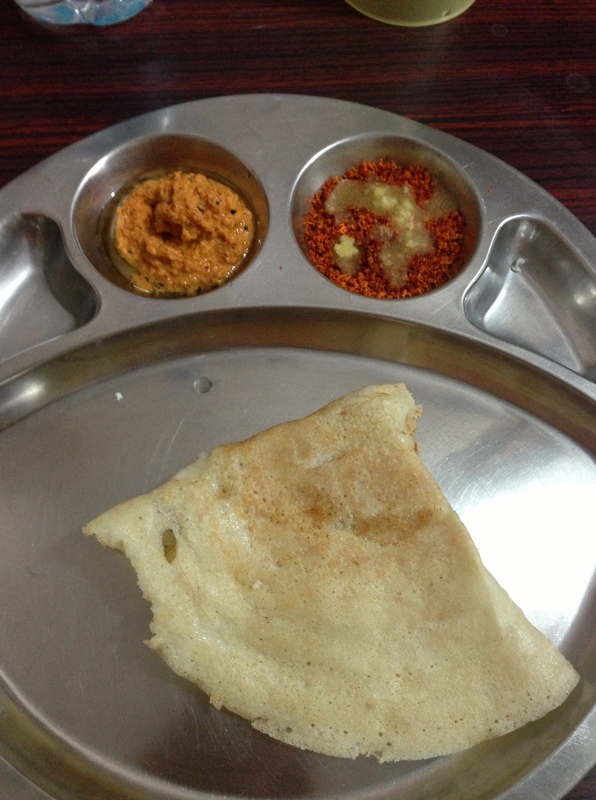 My mother-in-law made dosa for me for dinner. We headed back to the hotel. I negotiated for a half of a day of down time this morning instead of rushing to my in-law’s house early in the morning again. The break is much needed. Since AF hadn’t shown, I had a half of a second of a delusion that maybe we got lucky last month.. that it was finally our turn to get pregnant in between IVF cycles. Well, we’ll have to wait until next month for that. But I am glad that AF chose to arrive at the comfort of our hotel room, so I am a lot more well prepared for it. We also did our travel workout this morning in the hotel room. I am proud that we did it but boy, it was so exhausting to be jumping around, doing push ups, burpees, and all sorts of crazy things with very tight and heavy muscles and a very jetlagged body. This is day four. Five more days to go. 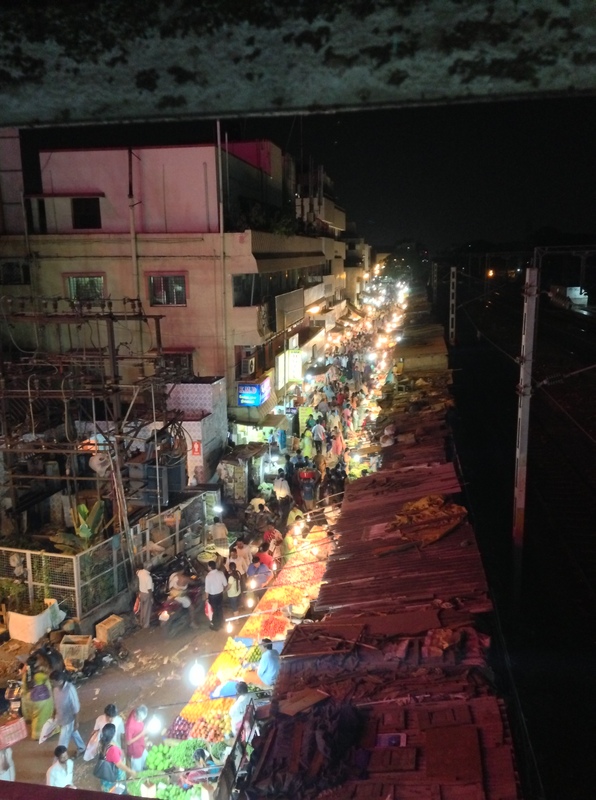 After a 24-hour journey, we arrived in India and things are going well despite the very hot and humid weather. The flight to Hong Kong was uneventful. We watched many movies, ate every single meal, and slept some. I finally watched Frozen and Gravity as well as six episodes of Big Bang Theory and three episodes of Elementary season 2. By the time we arrived in Hong Kong, it was 4am PDT. Fortunately, Hong Kong is such an efficient place that from the time we exited the plane to the time we got to see my dad, it only took 15 minutes. Reunion with my dad was so sweet. He was his usual self, warm and caring. We had dinner with him and chatted for about an hour before we headed back to the terminal. He handed me a little thermos that he thought I could use in India. Apparently it can keep beverages hot for over seven hours. He also bought me books and magazines. I really missed my dad and was so happy that the flight was on time. Not so lucky with the second flight. Good news is that it was a direct flight. However, it was delayed. By the time we arrived in India it was already almost 1am. We had no trouble this time with our female immigration officer. It was a joke last time when we were questioned by a male immigration officer of the reason we were staying at a hotel and not at Bob’s parents. I was shocked that we had to explain our life to a stranger that had nothing to do with us. He even turned his head and gossiped with the officer across from him. Luckily, we were not subjected to any of this nonsense this time. After we went through customs and picked up our luggage, we headed out and were greeted by staff of the hotel where we’re staying. I can’t tell you how happy I was to see such a stranger holding a sign with Bob’s name at 1:30am. All I wanted to do was to take a shower and crash. The airport was a lot calmer than the last time we were here. I couldn’t get over the image of all the people crowding the arrival hall after midnight. This time, there were only a few people. The room is very comfortable, just like how I remembered it. Breakfast was great. 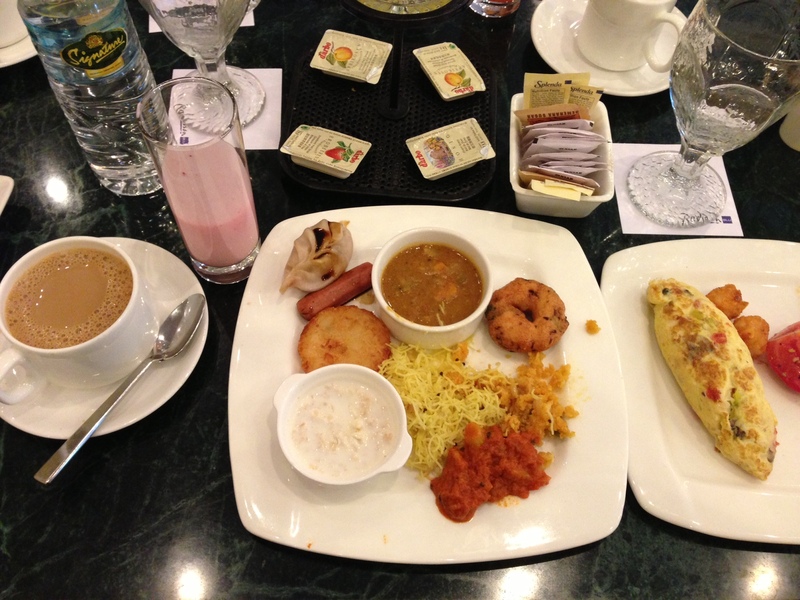 It was a combination of South Indian food, plus some Chinese, and some Western style breakfast, with a cup of Indian filtered coffee. We took a taxi to Bob’s parents’ place. I vaguely remember the roads. Everything felt so familiar. When we rang the door bell, we were received warmly. This was so unlike the last time we were there. During our first visit, I was told not to go visit them at their place. This time, instead of being told not to go visit them, my mother-in-law this time repeatedly expressed the desire to have us stay with her. She asked me several times why we decided to spend the money on a hotel room. I just smiled and told her, “Next time”. It was a lovely first day visit. My in-laws were genuinely happy to see their son. It warms my heart to see the bond between Bob and his dad. They pat on each other’s shoulders and smile. They chat about various different things, the kind of interaction exists only between a father and a son. I can’t help but wonder if Bob will ever get to experience that kind of bonding time with his own children in the future. Compared to the first day of my first trip, the first day this time was much more manageable. In 2012, my MIL came to the hotel room on the first day, took us to the most crowded local street for shopping, took us to her sister’s place for a visit, and finally sent us back to her apartment at the end of the day. It was one very tiring day full of cultural shock, jetlag, being bombarded with questions by salespeople at the first shop about Bob’s marriage with me, and smiling to relatives who were strangers. This time, we went to my in-laws’, had lunch, took a very long nap, had dinner, and called a taxi to go back to the hotel. So much better. Of course my mother-in-law is still upset about Bob marrying me. But offering me jewelry is such a huge step forward. I have no complaints about that. My father-in-law appeared more open this time. He still doesn’t directly talk to me though, which is fine by me. It is really hot and humid here. I rarely wear my hair up in a ponytail. After I washed my hair last night, it became so frizzy that I couldn’t tame it without tying it up. 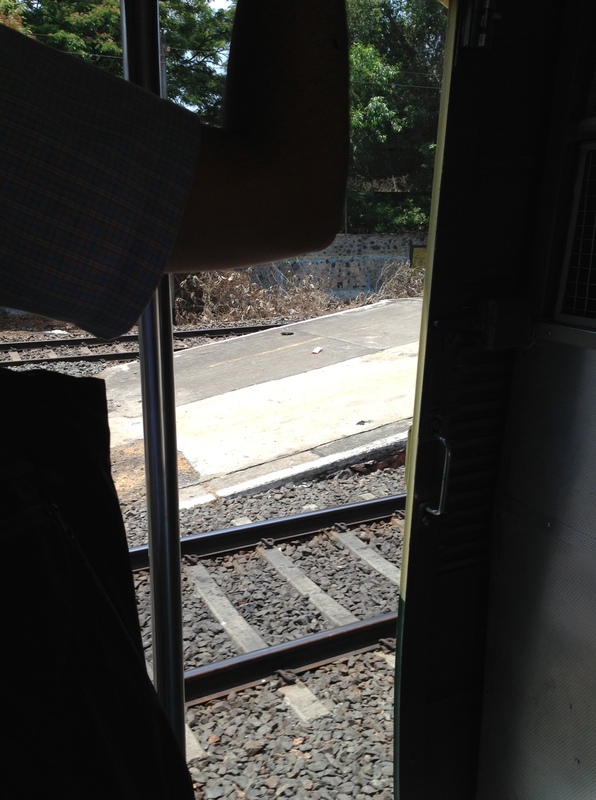 We walked ten minutes to the train station in the heat and took the train which cost only 10 rupees each way. See the train without doors? People just hang out there without the fear that they’d fall out of the train. 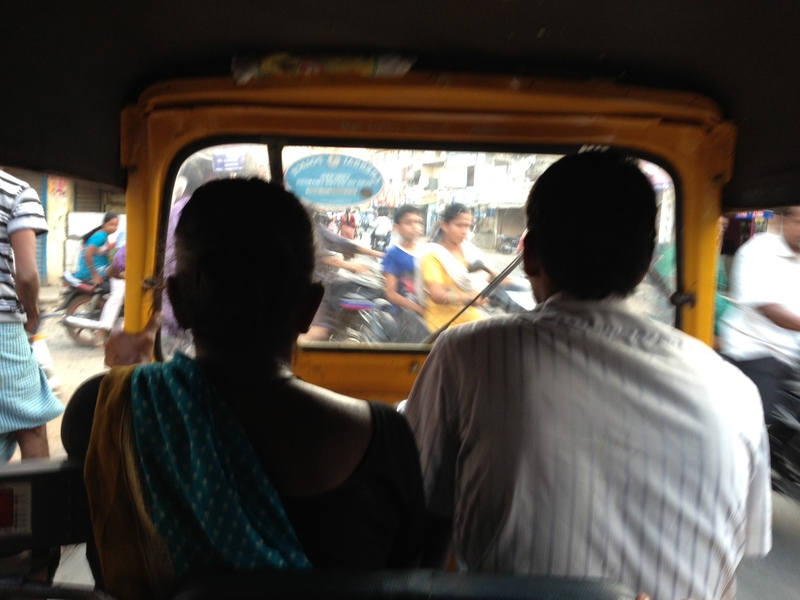 When we arrived at our destination, we had to take an auto rickshaw to my in-law’s. By now, we know the drill. I stay behind while Bob goes to negotiate for the fare. He got very good last time with his Tamil and was able to bargain for the local price of 30 rupees. The drivers raise their price when they see me. However, this time, he couldn’t negotiate for lower than 40 rupees. He definitely needs more practice on that. 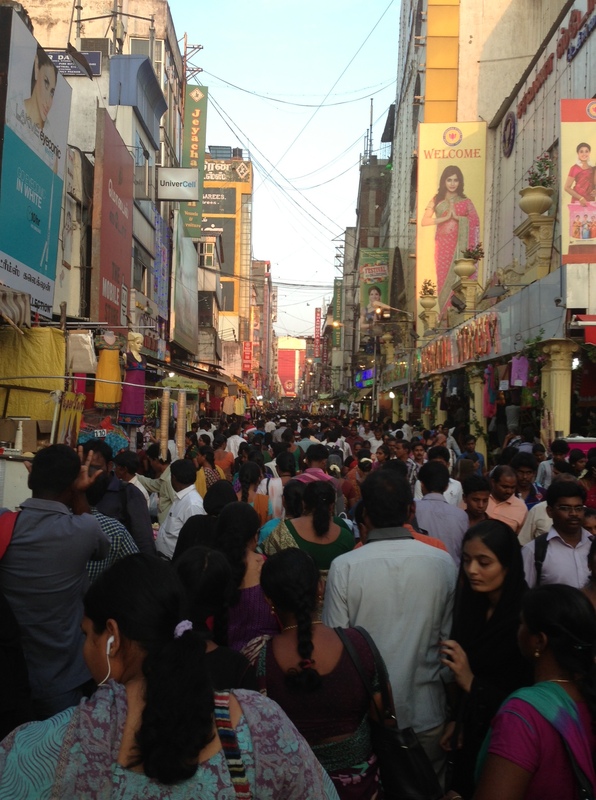 In the evening, after another three-hour nap, we braved ourselves and went to the most crowded shopping street here. I also know exactly what kind of clothes I want to buy this time. It felt so nice to walk into an air-conditioned department store. Although where we went was very local, I didn’t get too many stares today. I searched through racks and racks of clothes with a saleslady standing very close to me, waiting for me to make my choice. I am not used to that but I am okay with it. What I am not okay with was the second place we went to. You stand in front of the counter facing a ceiling-full of folded, plastic bag covered shirts. You rely on the salesperson to pull shirts for you and you keep on shaking your head. Nope. Didn’t make a purchase there. I did buy two shirts that I liked from the first place. It was quite an experience trying on clothes when my body was super sticky. All in all, it has been a very lovely visit… but also very tiring. All the people, walking, stickiness, crazy frizzy hair, thick air, jetlag, understanding my MIL’s English… Two days done already. Seven more days to go. So far so good. Will be traveling to Pondicherry tomorrow, which is the town featured in Life of Pi. Thanks for reading. Good night! I don’t look forward to the long flight to Hong Kong, but I am thrilled to be able to meet my dad at the airport for about an hour before we board another plane to India. Our layover is about two hours twenty minutes. I have been praying for the plane to arrive early so that we can have more time with my dad. I haven’t seen him in 18 months so every single minute counts. We’ll be arriving in India after midnight. The hotel is about 15 minutes away from the airport. We stayed there last time so nothing should be too surprising. I get asked this question a lot, “Are you not staying with your in-laws?” Nope. Still not there yet. My in-laws have a really nice flat, spacious with nice furniture. They even have two bathrooms. However, their bathrooms are still those that don’t have a shower stall. So after you shower, you have to wipe down everything, which defeats the purpose of a shower as you’ll start sweating like crazy. I lived like that when I was a little kid. No thank you. Plus I am not ready to see my in-laws 24×7. So hotel it is. I am willing to spend that money for some peace and quiet. I look forward to that all-you-can-eat breakfast at the hotel. 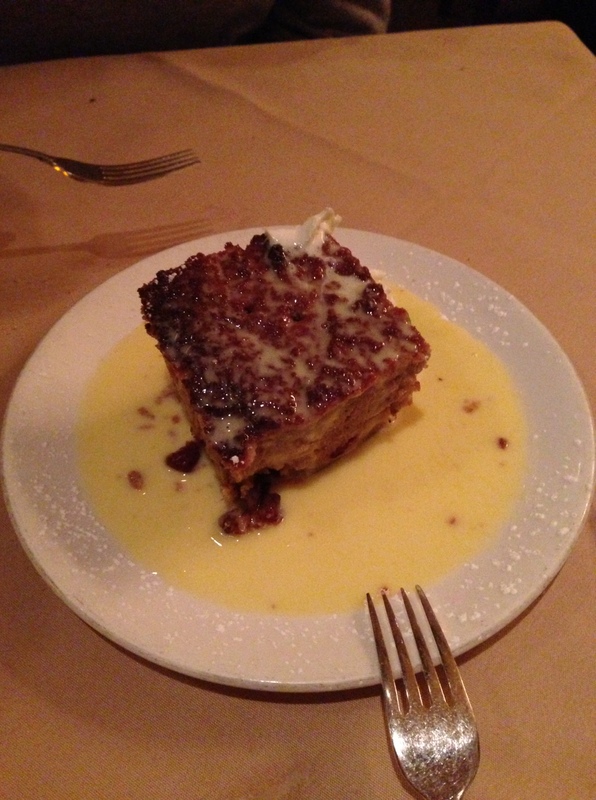 It was delicious last time. I am surprised I did not become a big fat lady after 9 days of that at the last trip. In about 30 minutes, we’re going to head out to the safe deposit box at the bank to store my engagement ring and my diamond pendant there. Bob is totally against the idea of me wearing my engagement ring in India. He said it’s not a good idea unless I want to get my fingers chopped off. 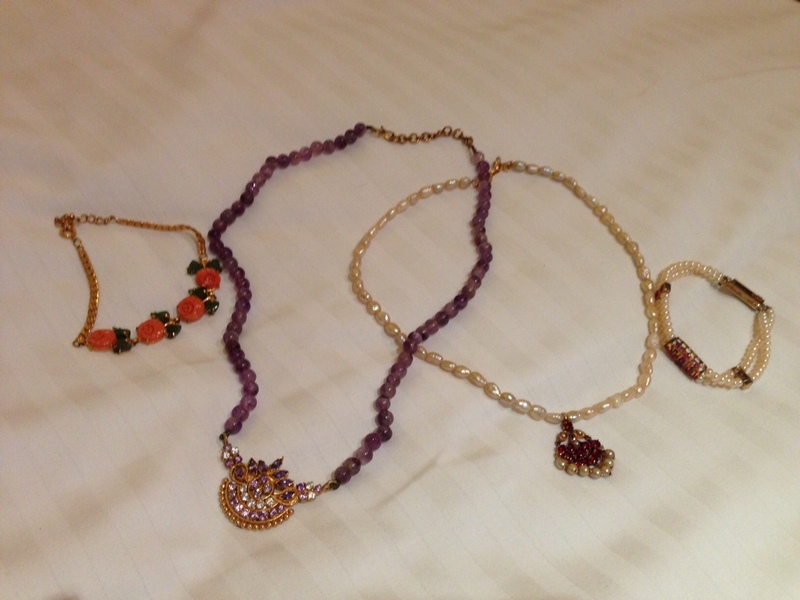 Last time we had a long layover in Hong Kong so I handed my mom my jewelry so I didn’t bring it to India. This time, I can also hand it over to my dad at the airport but there is a possibility of a flight delay. In that case, I would definitely have to bring the jewelry to India, risking losing my fingers. Plus… Bob doesn’t want his mom to see the diamond that he bought for me. So I’ll part ways with my precious engagement ring for three weeks. Bob has been looking for a job. He has had many phone interviews and some onsite interviews. No offer yet. But I am so happy for him that he gets to practice his interview skills so that when THE job rolls around, he will be very skillful in his interview skills that he can shine through during these meetings. He also has an onsite interview with a big company scheduled when we come back. On the TTC front, today is 11 days past ovulation? My chart is still a little wacky as the temperature spike was a little weak. Cervical fluid was not very obvious and my cervix’s height was very difficult to tell if ovulation took place. I guess two months after a chemical I shouldn’t expect everything to be back to normal. I get asked a lot what I will do and when I’ll proceed to the next step. I thought about writing Dr. E an email asking her what she’ll do differently next time if we cycle with her again. I just thought about it. I haven’t written her yet. Mentally and emotionally, I am still not ready yet. I continue to do well though. One of my friends is going to transfer her frozen embryo in a couple of hours for a second child. I want nothing but the best for her. I want this embryo to stick and I want her to be successful. I don’t think I’d think or feel the same a couple of months ago. The Lord is good. One last thought from last week. There was an insurance agent who came by and explained all these insurance policies for things like cancer care, accident indemnity, and short-term disability. I was particularly interested in the short-term disability one since the plan pays you cash up to a certain amount during an event such as maternity leave. After discussing it with Bob, we decided against it. One reason is that we’re still out of one job so money is tight. Another reason is we don’t know when we’ll get pregnant. So paying into a plan not knowing if we’ll benefit from it is a bit much. If I were fertile and could plan like those people who get pregnant the second they lay eyes on their husband, this would be a great plan. Oh well…. We just have to save up money again for when I get pregnant and give birth. Okay I’ll write an update when I have a moment in India. See you all soon! I like that place. I really do. Ever since my chemical pregnancy, I definitely had a setback with my quest to feel peace, love, and joy for other people’s pregnancies and newborn babies. Their sight bugged me. I hated how I felt and reacted. I know it is typical and common for us to feel this way at times. It’s for self preservation. But… I missed that period of time before my pregnancy that I was feeling good for other people. Recently, I arrived at that good place again. Let’s start with all the ladies that had recently given birth or were about to give birth. They are mostly people I know from church. I talked about some of them here. About two weeks ago, I saw one of them sitting somewhere not too far from me, looking nice and slim from behind. She was the one who tried for many years and somehow became pregnant right before she signed the papers for the adoption agency. Somehow something clicked in my heart and urged me to go talk to her after service. And I did. I immediately went up to her, tapped on her shoulder, and told her that she did not look pregnant from behind. But in fact, she was about to give birth in two weeks. We chatted about her pregnancy, her scheduled C-section because of the baby’s breech position, and how she had to arrange her work schedule for maternity. I was sitting there listening to her and did not feel any jealousy at all. I wasn’t even thinking about how I was feeling. I was genuinely engrossed in that conversation with her. Afterwards, I realized that I stood next to her, talked with her, without feeling bad or repulsed. Such a liberating feeling! The following week, I was a greeter and again saw a number of women who just gave birth or who were about to. The girl that I chatted with the previous week walked by uncomfortably. I hugged her and checked in with her. My heart again was fine. When I went around the church to take attendance (part of the duty of a greeter), I walked into the family room and saw that one of the ladies was nursing her newborn. She was the one who gave birth at 43 to her third child after struggling to get pregnant for a while. I had avoided her in the past many months. When I walked in and saw her, my first reaction was not to flee. 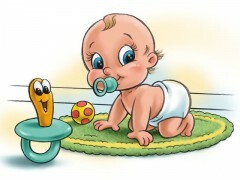 I actually knelt down, took a good look at the baby for the first time, and asked her some questions. I walked out of that room feeling fine. That’s such an improvement for me! I am loving the grace and mercy that God has shown me and allowed me to have as I am spared of the usual jealousy that crept back into my life after my own pregnancy loss. Even Bob commented on how good of a job I was doing when I “liked” the picture of my church friend’s newborn baby after her C-section last Wednesday. This has extended to my feelings for my friends in the blogging community. Recently, there is a surge in the BFPs for many of my blog friends after their own struggles for years and years. And there is a discussion of survivor guilt and what to do with one’s blog after one finally becomes pregnant. By the grace of God, I have been able to feel joy and excitement for all of you girls. Isn’t that a wonderful thing? It’s not my own strength or doing. All of this comes from the Lord for answering my daily prayers and plea to be full of love and free of jealousy. Thank you Lord for answering my prayers. I would love to continue feeling this way, celebrating others’ pregnancies and newborns without feeling jealous. I know that it won’t be accomplished without daily prayers to the Lord for Him to sustain me. I love being in this good place. I hope this will be my permanent destiny… although I know that I may slip back in the future some time, I am confident that I will eventually come back here, with God’s help. This is the 100th post of this blog. I started in June 2013 and can’t believe that I am reaching the 100th mark before this blog reaches a year. Publishing it on our 5th year dating anniversary is the most fitting thing to do. Five years ago today, Bob and I went on our first date. Honestly, I wasn’t impressed with how things went on our first date. To explain why, I have to give you some background. Bob grew up as an only child in a Hindu family. The only way that he knew to get a wife was to follow his parents’ lead and get an arranged marriage. Before he became a Christian in 2006, his parents arranged for him to meet with a couple of girls, hoping that he would eventually marry one of them. Things did not pan out. Bob became a Christ follower and was urged by close Christian friends to not to marry anyone other than a Christian. So he started an online dating profile. That was how I met him. We communicated online for a couple of weeks and I was impressed by his sincerity and his responsiveness on emails. However, given Bob’s history of his non-dating life and as an only child, he did not know a girl’s expectations of a guy on their first date. I am the first girl he went on a date with. And the last girl he will ever be with. He definitely, absolutely had no experience whatsoever about what a guy should do on a date. I am not going to go into details here. They are not important at this point. All I will say is that, if I based our potential of our future on Bob’s performance on our first date, I would not be writing this post about him now because we would not have gone down the path of getting married. What’s more important to mention about is what happened the next day. After our first date, I woke up at 6:30am and just could not fall back asleep. I really liked how we interacted on our emails, phone calls, and online chats. I was conflicted with a few things that happened during our first date. So at 6:30am, I dialed Bob’s phone number. Mind you that we parted ways at 11pm the night before. That poor guy had to drive 50 minutes to get home. He probably did not go to bed until after midnight if not later. There I was, a crazy woman calling him up at 6:30 in the morning. The first woman with whom he had ever gone on a date. His reaction and response changed how I saw him and the potential for our future relationship. 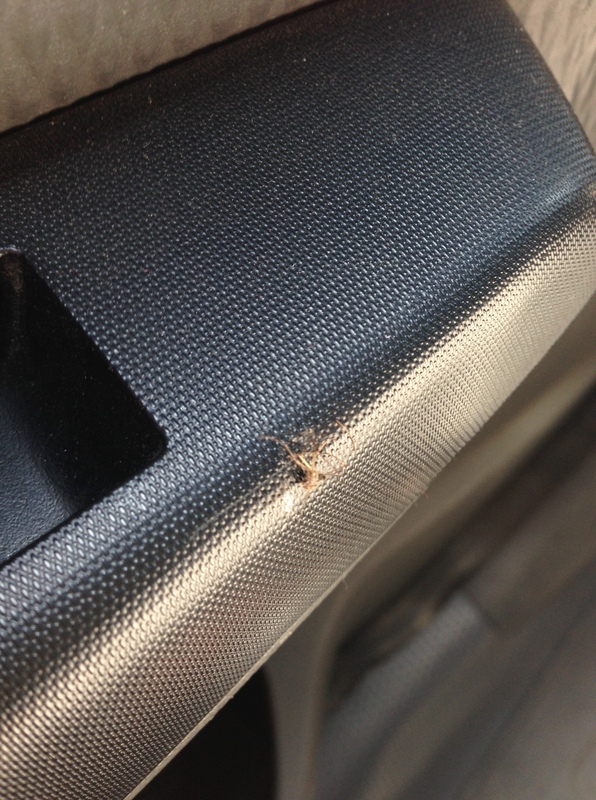 I told him what bugged me on our first date. (Lunatic… I know.) He not only gave me full attention and listened to what I had to say, at 6:30am, he was frank and told me that he did not know these things prior to meeting me. He said that he would try to learn and remember these things on our future dates. I was speechless at that point. I probably did not really think much before I called him. I didn’t have an expectation of how the phone call would turn out. I probably just really wanted to get things off my chest since they bugged me. But I was touched that he did not mind me calling him bright and early, essentially pointing out all the things that did not go well on our first date. Not only was he not mad about being woken up at 6:30am but was willing to listen and try. That set the tone for our relationship. He is willing to listen and to learn to love me the way I feel loved. The rest is history. I wouldn’t have known the path we were going to take as a married couple. I thought that we were going to follow the path that I had set for myself: getting married, waiting six months before trying for a baby, getting pregnant within a few months, giving birth at 38, resting a little before trying again, and getting pregnant with number two before 40. On that first date, I of course would have had no idea what would be in store for us. The opposition that we faced from Bob’s parents, the fight that he had to put up with them in order to marry me, my surgery, my diagnosis of diminished ovarian reserve, and the numerous decisions that we have had to make as a couple regarding treatments to eventually have a baby. Nothing has been easy. But that fateful date on April 4, 2009 and the subsequent phone call on April 5, 2009 sealed our fate as a couple that would face any life’s challenges together. I didn’t know it at the time. But I feel so grateful that we met and I made that phone call. I didn’t know what was going to be our future. But God did. And God knows how our story will continue. We have to trust and obey. Today, we found an excuse to eat. 🙂 We had dinner at one of our favorite restaurants. 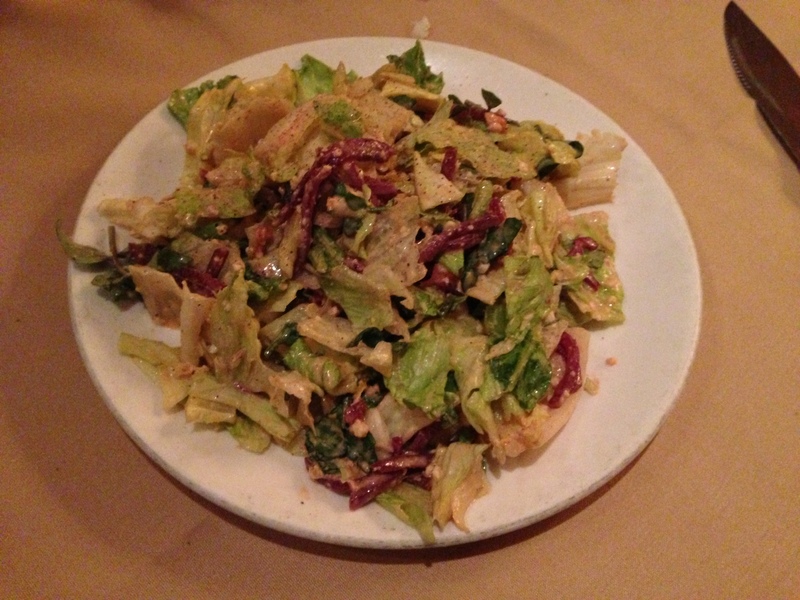 This salad was so so good. 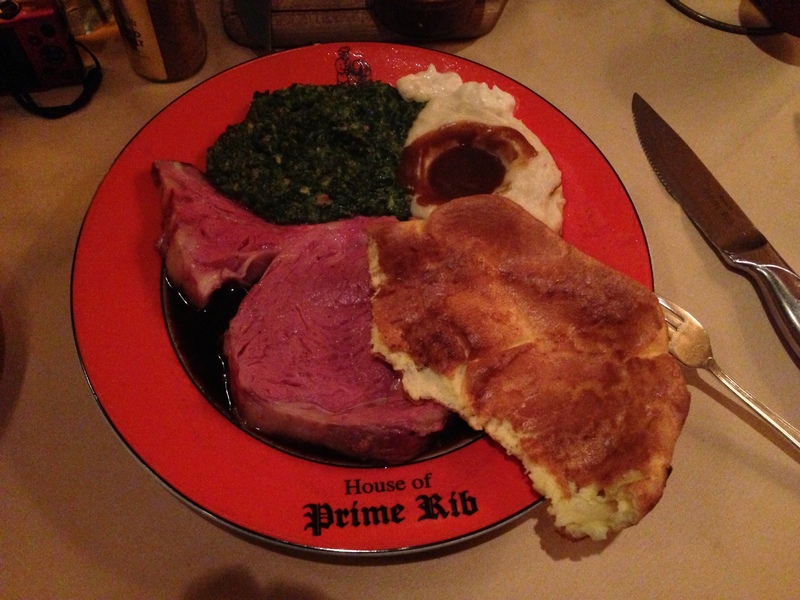 I had been craving prime rib for a very long time, especially with Yorkshire pudding. Here you go. My 100th post. A celebration of this beautiful relationship. I am truly thankful for what I have in life.